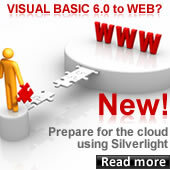 The Visual Basic Upgrade Companion can be customized to match your specific migration needs. One of the most important considerations while upgrading to .NET is the final product precision and how it can be improved. User Extensibility and Customization: The Visual Basic Upgrade Companion features a simple yet powerful user definable extensibility approach called “Custom Maps”. This editor allows the end users to define transformation rules to convert VB6 keywords and/or 3rd party library references to a particular .NET construction. The User Extensibility and Customization can be exploited to transform as many 3rd party libraries or VB6 keyword usages as the user want. The overall precision and library coverage can be importantly improved by using this extensibility and customization approach. 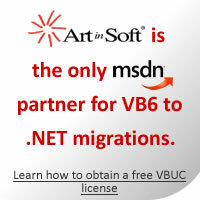 Proprietary Extensibility and Customization: The proprietary extensibility is performed by ArtinSoft specialists on user request. This is the most powerful approach since it allows highly detailed transformations into the resulting source code. Since this extensibility approach is performed by our personnel, the possibilities are immense; from adding the required transformations to upgrade a particular non supported legacy control to its .NET counterpart with specific member handling, or to define special handling techniques for complex language patterns to be converted into optimized .NET constructions and so forth. Read our CASE STUDIES to see some examples on Proprietary Extensibility and Customization.